Laundry detergent history begins around the time of World War II. Despite soap products being used for cleaning bodies and clothing as far back as the time of the Egyptians, soap flakes fell out of use during World War II. 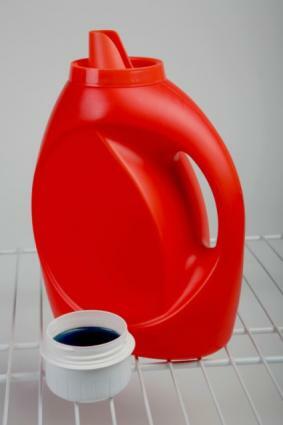 Laundry detergent provided a cheaper, more efficient method for cleaning. Detergent is not actually soap. Laundry detergent is a chemical compound that helps clean clothes in washing machines because it helps keep the dirt suspended in the water. When it comes to cleaning clothes, the washing machine is the thing, not the detergent. A washing machine uses water and water pressure to loosen dirt from clothing. Detergent helps break down the barriers between water molecules so the water is more efficient. The detergent also helps keep the dirt suspended so that it will be washed out when the water is drained. Historically, standard soap was used when clothing was scrubbed by hand or washed in the river. During the times of the ancient Egyptians and Babylonians, soap came from rendered animal fat and ashes. Lye would eventually become a popular soap product. Soap became the work of the devil during medieval times. The abhorrence of cleaning body and clothes led to a decline in soap products which some historians speculate contributed to the spread of the black plague (generally transmitted by the fleas on rats) because people were so dirty. Standard and lye based soaps are too harsh on the internal mechanics of washing machines. Modern laundry detergents provided an alkali based cleanser that helped the water clean clothes, but modern detergents are detrimental to the environment because the detergent did not break down. In fact, once in the water, the detergent remained and could be seen foaming in cesspools, water breaks and even in the ground water though it was 'cleansed.' Modern scientists continue to work on green safe products to help reduce the amount of water pollution that laundry detergents contribute. The major milestones in the development of laundry detergent history take place post 1945 when the modern washing machine began to replace scrub boards in American homes in the post-war boom economy of the late 40s and early 1950s. 1950s - Liquid and powder laundry detergents become popular purchases along with bleaches for whiter whites and fabric softeners to gentle the water and soften clothes. 1960s - Stain removers and pre-treatments are added to the shelves. Enzymatic laundry detergents are introduced. 1980s - Varying temperature laundry detergents and concentrated laundry detergents grow in popularity. 2000s + - Laundry detergent tablets (all in ones); biodegradable and green friendly products along with water conservation are big ticket issues for modern concepts of laundry detergent. The history of laundry detergent continues to impact the modern environment and clean water standards. Check out some great biodegradable products and suggestions for protecting the environment at home at Love To Know's Green Living channel.